I can hardly remember studying a civilization in the history class without discussing the attire and the fabrics worn by the people. Clothing in a society is indicator of many things – economy, social structure and hierarchy, traditions and artistry, to name a few. Every society observes certain rules regarding clothing. The traditional societies are more rigid and do not appreciate variations, whereas the liberal societies allow for experimentation. The traditional Indian Couture reminds one of extravaganzas, brilliance and luxury. It has always interested not only the fashion buffs, but also even a simple traveler. 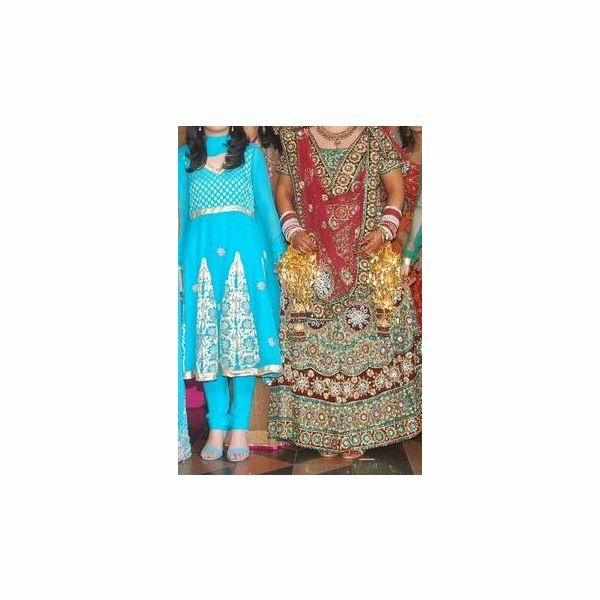 Finding foreign travelers comfortable in a lehnga choli (an ankle length skirt with a blouse) and a punjabi jutti (a flat footwear of leather, with embroidery at times) is a common sight. Festival season and a wedding are the best time to observe the greatest variety of attire. One gets to see Georgettes, Silks, Crepes, Chiffons in bright colors – red, yellow, purple, blue, green, all in a variety of shades flowing all over. The embroideries are intricate and examples of fine workmanship. The same attire may give a very different look depending on the way it is stitched, the fabric used and the way it is worn. Through this article, we look at some of the traditional dress types of women in India. Saree (Sari) and Blouse: A Saree is one of the most gorgeous garments that a woman can wear. It is a strip of cloth, five meters long, which is sensually draped around and serves as a lower garment. The upper bodice is known as the choli (blouse). Traditionally, it is just meant to cover the front with the back bare. This garment can be worn in a number of styles. The most common style is one in which a set of seven to ten pleats are made in the front and a pallu is left loose from the left shoulder. It is available in a variety of fabrics and a myriad of colors. It is worn by women daily not only in India but in Sri Lanka and Bangladesh too. Nearly every state has its own specialty of this attire. The uniqueness comes from the fiber, the weave and the embroidery. One can easily find snap shots of Bollywood (Indian Film Industry) actresses wearing a saree. Salwaar Kameez: It is often known as a Punjabi suit. It is one of the most commonly worn dresses. It originated in the north of India but spread over to the other parts of the country. Salwaar Kameez are a popular dress in the present state of Pakistan too. A Kameez is a knee length shirt worn with a pleated lower garment. They are designers’ favorites as many experiments are possible with both garments – the salwaar as well as the kameez. There are many ways of getting these made. A variation of the Salwaar is a Churidaar. Churi means bangle. In a Churidaar, the lower garment gets collected near the ankle. The Duppatta or Chunni is an integral part of a Punjabi suit. It is discussed separately. Sharara: A Sharara is again a three-piece garment. It owes its origin to the Mughal era. The lower is like a flowing, long, divided skirt. The upper is again a choli. A Sharara is also accompanied with a Duppatta. Lehnga Cholli: It is also known as Ghagra Cholli, Channia Cholli in different regions. It is a three-piece garment. The Cholli is the same as described above. The Lehnga is a long flowing ankle length skirt. It is a common dress in the states of Gujrat and Rajasthan. For everyday use, these may be made from cotton fabric. For less functional wear, the dress gets flamboyant with heavy embroidery and bright colors. Indian brides love to dress themselves in this dress for their wedding day. Duppatta: It is also known as Odhni, Unni, Chunni, Chunari. It is a rectangular piece nearly two meters in length. It is an accompaniment in a Salwaar Kameez, Sharara Cholli and Lehnga Cholli. It is an indicator of modesty. Again, it could vary in the fabric from cotton to georgette to silk, depending on the fabric of the basic garment. It can be worn in a variety of ways, across the shoulders, from back to front, covering the head.